So with a night to try and roll some dice, while playing the same game. 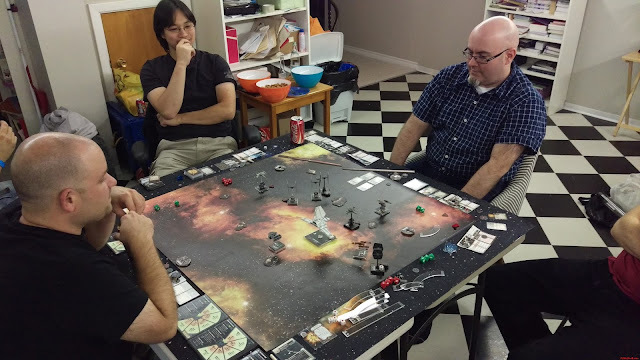 Five of us took on the Empire in an attempt to disable a shuttle and capture an Imperial Officer. 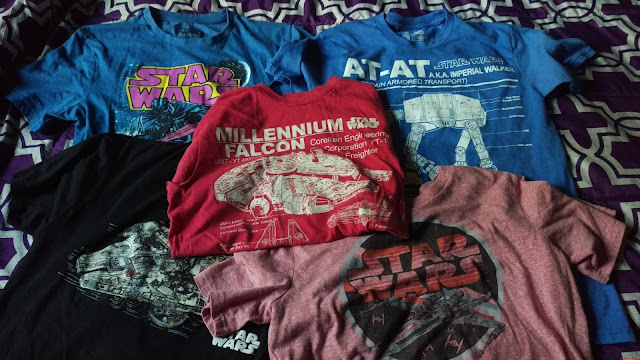 It's all part of a Co-operative campaign called 'Heroes of the Aturi Cluster'. It's becoming very popular, and the two best parts are that it's free and it's designed by Canadians. 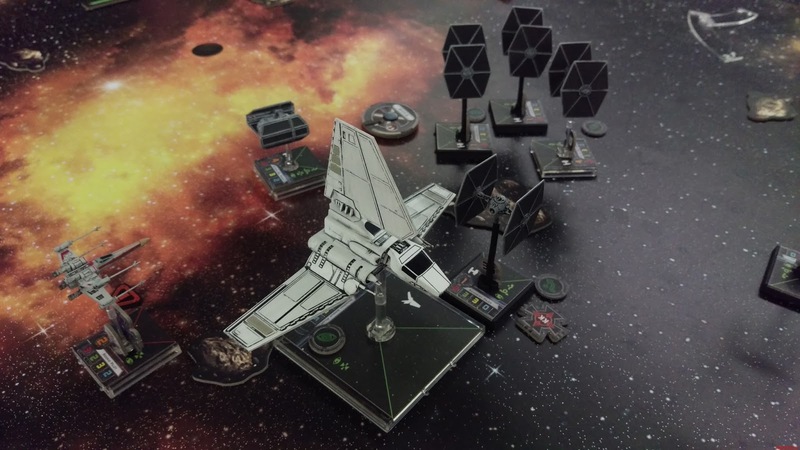 You can download it at DockingBay14 Campaign It plays with the X-Wing Miniatures game by Fantasy Flight Games. One thing about the campaign is that it's completely stand alone and the Empire are controlled by AI designed by the creators of the campaign. It's been well tested and you can even play solo or with up to 6 pilots in your squadron, battling it out in 15 missions. You can read my big article on it at WWPD. For now, lets get to some of the pics and thoughts on Friday's game. 'There's TOO many of them!' 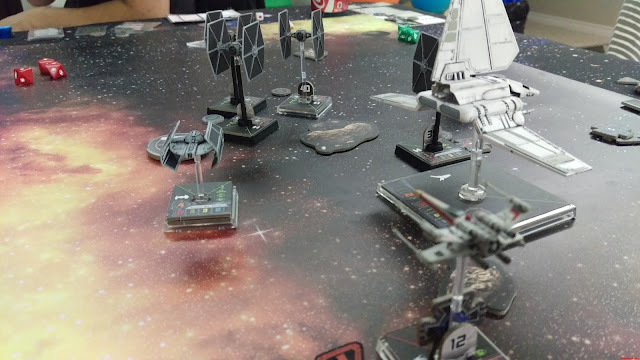 Quite frankly, even with 5 of us against all these Tie Fighters and Tie Ad'wanced Fighters, we were outgunned and getting shot to pieces by the midway point. The Y-Wings piloted by Dennis and Tristan were doing their job of slowing down the shuttle, but the X-Wings couldn't get any Ties. I get I am jumping around all over the place, but the first few turns are just movement and waiting for enemy fighters. 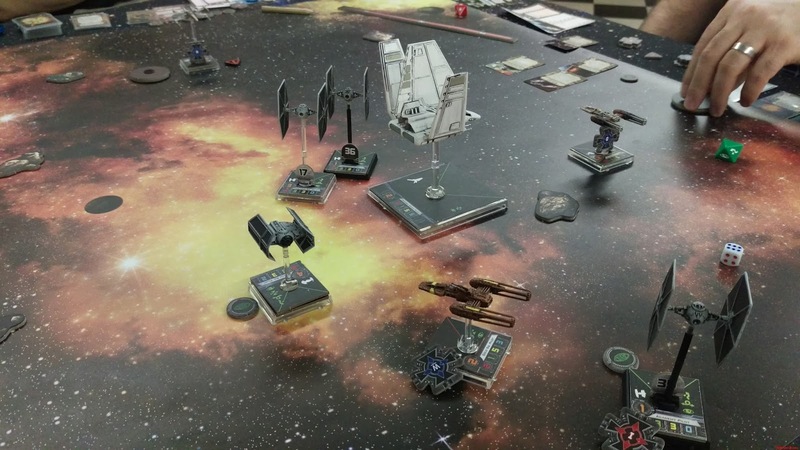 Dennis' Y-Wing passes in close to the enemy objective while trying to use his Ion Cannon against Tie Fighters to slow them down. My X-Wing swings just in front of the shuttle, trying to support as much as possible. Sadly, I would be destroyed on the very next salvo, as Dennis rolled for the AI controlled Empire and knocked me out with three direct hits! With no shields left, it would be the end of 'Devil-3', my pilot would later be rescued as he bailed out successfully. 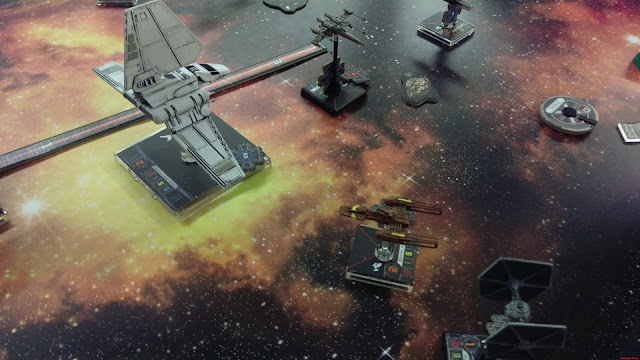 Brett was flying on my wing when I went down, he tries to get in attack position to score some kills and make some more room to maneuver around! I think he splashed one fighter on this night. Tristan, Kevin and Dennis look on as we try and come up with some sort of plan. 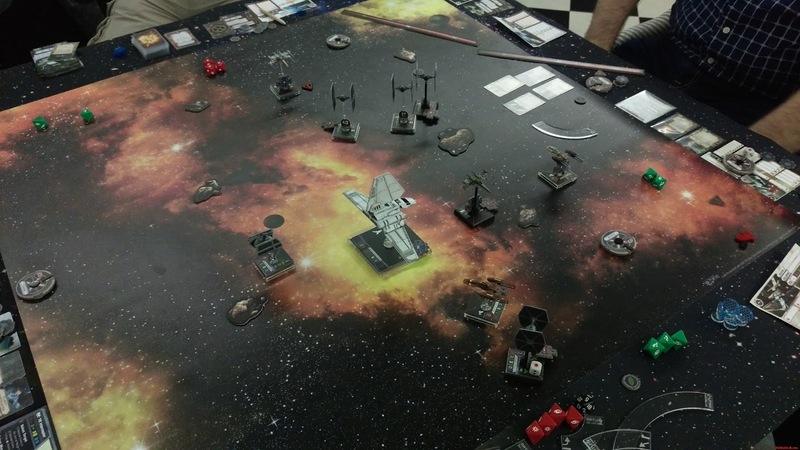 The sector is quickly jamming up with enemy fighters! The Empire pilots may have a plan of their own. The protection was just too much to handle. A few ships had already been destroyed, Tristan would flee the board edge and Kevin made a run for the other side. He would take ONE hit at long range, fail to evade the enemy hit and would also be destroyed. Bailing out and losing his most expensive upgrade in the process. More X-Wing to be played this week, we'll be gathering at Tristan's place this time around. 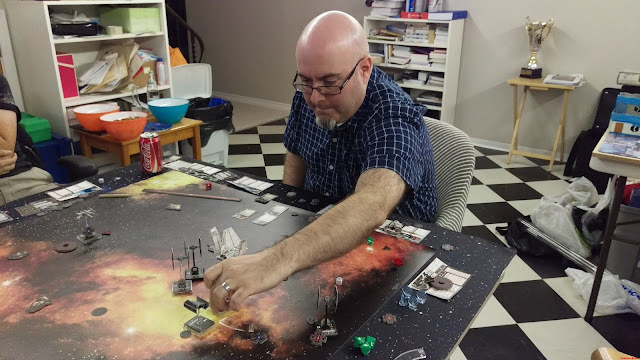 We get a choice, attempt to capture the Imperial Officer or one of the other random missions we had selected before the game began Friday. May the Force Be With Us. All pilots to your ships! Skids up in five mikes! That battle looks awesome! Love the blacked out flight stands on the TIEs! Might have to steal that idea for myself. Lastly, ya gotta fix that lambda shuttles wings! The nerd in me is raging, lol. We swept them so we could move other models near it, we had a good time though! I really want to try that game some time. Looks like a hoot. Welcome to schedule a game anytime!